When in contact, matter and antimatter can annihilate one another to produce pure energy―that’s why there is extremely little naturally occurring antimatter in the world around us. Mass is made of certain kinds of particles. The Standard Model lists them all. In its scheme each particle is paired up with an antiparticle. One way to think about an antiparticle is that it is the particle but travels back in time. Another is its charge is opposite. When a particle meets its antiparticle they annihilate immediately. They make two photons whose energies are equal to the masses in accordance with: E = mc2. 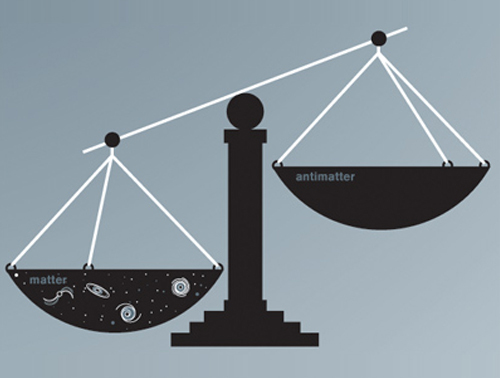 So the Problem of Antimatter’s not: Why is so little of it left? It’s: Why is there any matter left? Which is to say: It seems that the original proportion wasn’t half and half. How come? Physics has a symmetry it calls CP. It says exactly 50-50 is the way it has to be. Physical cosmology contrives an answer to the Problem. It says CP Symmetry was violated when particles were born in the Big Bang. There are some suggestions as to how this happened but they look like little more than stirring up the same old Problem, like the beat cop saying to the beach bum: Move along. More recently it turns out that the weak force doesn’t follow CP Symmetry. At last, there is a way to have more particles than antis. The celebration is a short one. CP violation, as it’s called, covers just a trillionth of the matter that we see. Back to square one: Why were there more particles than antiparticles?